San Francisco International Airport, situated in unincorporated San Mateo County, is the gateway to North America. Owned and operated by the City and County of San Francisco, this international airport serves Northern California and offers a direct rail service to San Francisco. San Francisco Airport is the largest airport in Northern California. San Francisco International Airport (IATA code: SFO) is the second-busiest airport in California and a hub for Alaska Airlines, United Airlines and Virgin America. Flights to San Francisco International Airport are available from various international airlines, including Air China, Air New Zealand and Finnair. SFO is a 15-minute drive or a 25-minute train ride from the city centre of San Francisco. Book your cheap flights to and from San Francisco International Airport online! San Francisco International Airport first began as Mills Field Municipal Airport, when it opened in 1927. By 1931, the airport’s named was changed to San Francisco Airport and from that time, its increasing popularity cemented its status as an international airport. Over the years, the number of passengers passing through the airport’s doors has increased, with over 50 million arriving and departing in 2016. The officials running San Francisco International Airport continue to find ways to improve the airport’s four terminals, runways and services. With all that’s currently available and all the planned upgrades, even more explorers will get to enjoy the pre-holiday experience that San Francisco’s airport offers. San Francisco International Airport includes a large number of retail outlets, including those selling duty-free products. These establishments house numerous items from various categories, including cosmetics, jewellery, fashion, accessories, sportswear, books, newspapers, electronics, souvenirs, maps and more. Make sure to become familiar with the baggage restrictions at the airport. Should you be coming from abroad and arriving at San Francisco International Airport, you may desire a delicious meal or refreshing beverage. You’ll be spoilt for choice with the wide selection of restaurants, cafés, bars, fast food branches and takeaway outlets. San Francisco International Airport includes a great collection of lounges, which are operated by various airline companies, including United Airlines, Virgin Atlantic, American Airlines, KLM, British Airways, Cathay Pacific and Emirates. To add to an already exceptional airport experience, you can enjoy a variety of art pieces situated throughout the terminals. Should you have a layover of four hours or more, why not explore San Francisco and the Peninsula Bay area via public transit? San Francisco International Airport even offers you the chance to pet trained dogs (and even a Juliana-breed pig!)! Each of these animals was carefully selected for their temperament and suitability to the airport. The animals all wear vests that say “Pet Me!”. Other facilities and services include luggage storage, delivery services, baggage wrapping, computer stations, car wash services, concierge services, medical services, a lost and found area, animal relief areas, business facilities, free Wi-Fi, kids activities, and accessibility for passengers with disabilities. Millwood Inn And Suites This ideally situated 3-star hotel is a 10-minute drive from the airport, perfect for business travellers who have early flights. It includes numerous features, including a fitness centre, business centre, 24-hour front desk, air conditioning, convenience store, laundry services and multilingual staff. Complimentary breakfast, Wi-Fi and parking are also available. The Westin San Francisco Airport This beautiful 4-star bayfront hotel is situated just 5 minutes from San Francisco Airport. It offers you a restaurant, bar/lounge, indoor pool, breakfast, Wi-Fi in the lobby, valet parking, a 24-hour business centre and a 24-hour fitness centre. A free airport shuttle is available. Four Seasons Hotel San Francisco This 5-star luxury hotel, situated near Westfield San Francisco Centre, is a 20-minute drive or a 30-minute train ride from the airport. It includes a wealth of amenities catering to many travellers, such as a full-service spa, a 24-hour business centre, daily housekeeping, air conditioning, terrace, in-room childcare, valet parking, a health club, a restaurant and a bar/lounge. Free Wi-Fi is also available. Foreign exchange can be ordered up to 60 days before departing South Africa. Only the person who ordered foreign exchange is allowed to collect it. Travelex offices are situated in pre-security in the International Terminal, and after security, in Boarding Area F, near Gate 71 in Terminal 3. 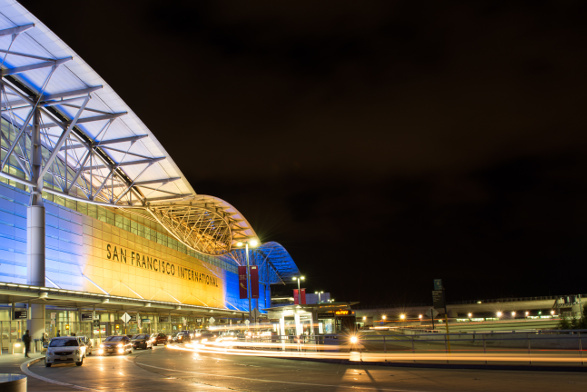 San Francisco International Airport offers several parking options, with various rates and restrictions according to whether passengers are travelling domestically or internationally. These parking spaces are also available for long-term parking. Valet services are offered as well. You may pay with cash or credit card (all major credit cards are accepted). San Francisco Airport sits 21 km south of downtown San Francisco. Transport options to and from the airport include: two rail services, buses, vans, Uber, hotel shuttles, and car hire.